Dr. Cleveland Evans writes about names for the Omaha World-Herald. 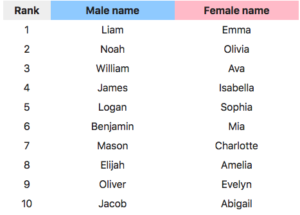 In his May 22nd column, he looks at the latest rankings of US baby names in 2017. On May 11, the Social Security Administration released the United States’ top baby names of 2017. On SSA’s lists, Liam and Emma rank first. Emma’s been No. 1 since 2014. Liam beat out Noah, which was on top the previous three years. But SSA counts every spelling as a separate name. Each year, I add together spellings probably pronounced the same to create lists I think more accurately reflect name popularity. When boys named Jaxon, Jaxson, Jakson, etc., are added to Jackson, 23,903 were born in 2017, ranking it first for the fifth year in a row. When Sofia and other spellings are added, 23,144 Sophias arrived in 2017. Sophia’s been No. 1 on my list since 2011. Last year, 11 percent more Sophias were born than Olivias, the No. 2 girls’ name. Want to know more? Read on to find out more about the top 2017 names in the US! ← How many Bay Area place names have you been mispronouncing?